Ah, the ubiquitous ‘Various Artists’, ‘Label Collection’ or ‘Sampler’: normally these are ones to avoid as they tend to be a random collection of the bigger names and the lesser known, who are lesser known for a reason, and sorting the wheat from the chaff is not worth the purchase price. This collection, however, demanded closer attention as it comes from two powerhouse sources of blues artists…the first is Blind Raccoon, who has been promoting and developing quality blues for a number of years and happen to be run by some of the nicest people in the murky world of marketing and PR. The second is Nola Blue (as in New Orleans, Louisiana, even though the label is based in Pennsylvania); a label only formed in 2014, with an admirable roster of blues artists, many of who are featured on this release. (Apropos of nothing in particular, the other delightful fact is that both companies are headed by females, who embrace the blues for us all). 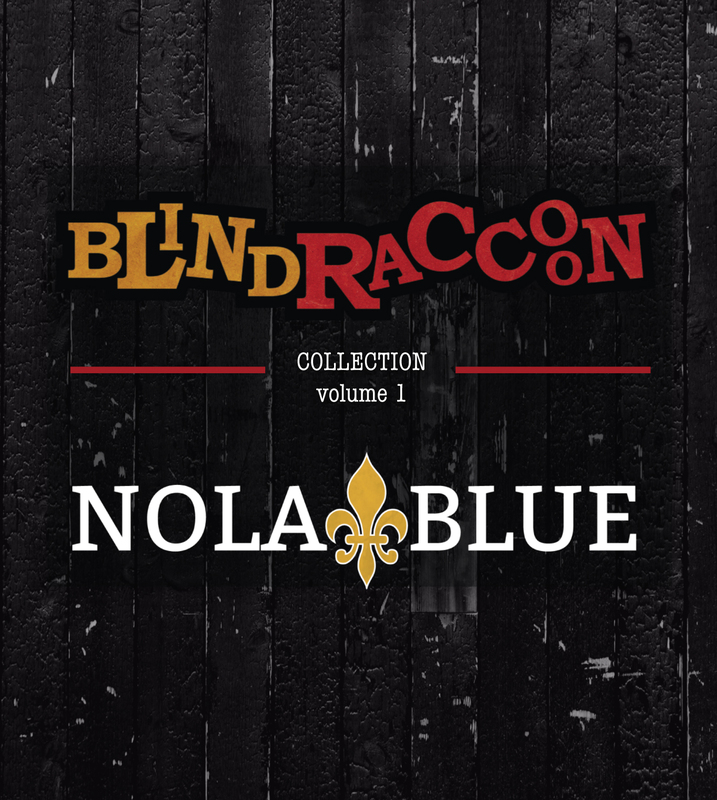 The downside to any collection is that, as a blues fan, you may already own some or most of the songs on the package and it can be difficult to justify the purchase…well, Blind Raccoon Nola Blues Collection Volume 1 is certainly full of tracks I already own but there are two that are not yet released and a few I have yet to get my hands on…so, the decision was made. It is a great collection of quality artists many of whom you will find reviewed on the pages of Bluesdoodles…just use the search feature to call ‘em up. Because of those reviews, I will discuss only some very high highlights and preview the four new ones. New ones first, and Nola Blue’s initial release was for Benny Turner and so it is fitting that his newest song kicks off this extensive collection. Who Sang It First is Benny’s adaptation of Jim George’s original song, Black Is Beautiful. On this reworking of the classic, he pays homage to the legendary blues musicians who have strongly influenced today’s music. It is a soulful blues that has great backing, with neat guitar and keys over the bass and hi-hat and drums. It’s a little too soul and laid back for me, but there is no doubting the quality from all concerned. The other not yet released track comes from the prolific and gravelly Glaswegian, Wily Bo Walker. He consistently releases strong and varied blues and this new one, Velvet Windows (Tremé Trippin’)is no exception although we will have to wait until late 2019 before we see the album from which it is taken. This has appeared on another compilation, Jock’s Juke Joint Vol. Four, which is reviewed on Bluesdoodles too. On this one Wily takes the traditional approach with that new feeling that he is so good at. His rugged vocals combine with superb guitars, horny horns to match the lyrics and neat percussion throughout. Blues Collar Woman is a recent single from Brigitte Purdy and, I’m pleased to say, it matches the quality of her last album, Still I Rise reviewed on these pages. This one starts with a lovely snare pattern…indeed the drums throughout are worth paying attention to. Brigitte’s vocals are low and sultry, even when she is singing about doing the dirty dishes! The guitar solo would sit nicely in a heavy rock track, but it still works here. A damn good blues with a hunk of soul and rock thrown in. Open Hand, Open Heart is from Professor Louie and the Cromatix and appears on their Songs of Inspiration album. This is a swinging rumba with harmony vocals giving it a touch of gospel…the organ takes centre stage most of the time with simple chords that work well and a thoughtful solo toward the latter part of the song. It all has a good feeling about it and a warm message behind it too. Evangeline by Blind Lemon Pledge: taken from the album of the same name it is a brilliant evocation of country blues pioneered by the likes of Son House. So much so, it has to have been inspired by the superlative Son House song Pearline and it is nearly that good… and that is praise indeed. Blues Been Mighty Good To Me by the peripatetic Tom Hambridge: Tom took time off from writing, playing and recording with other major artists to record his own album, The NOLA Sessions. The song is really a duet with the much-lamented Allen Toussaint providing piano and vocals alongside Tom. The atmosphere pours out of the speakers from the first note as they trade verses before we are treated to a classic piano solo. Voodoo Doll by the Microsoft Man, Jim Allchin comes from the only album cover that has a guitar amplifier that highlights all of the prime numbers through 1 million using some software he wrote. The track takes us to the swamp, with solid guitar work and a backing that is complex and clever; Hambridge’s use of the Toms (no pun intended) and cymbals should be part of a course most modern drummers have to sit; the bass is on the button too. You’ve Got A Secret from blues songstress Lawrence “Don’t call me Larry” Lebo has a lovely picked guitar over organ chords backed a by a solid rhythm and then a voice which is drenched in emotion as she tells of a deceitful lover. Add into that guitar and keys solos that impress but also, most importantly, fit in with the blues/soul emotions and compliment the song’s message…brilliantly. Not My Problem from Maybe Someday by Meg Williams: from a self released EP, (Meg has just signed for Nola Blue, so watch this space) this track supplies a funky blues with a soulful vocal over a neat guitar that sounds a bit like Stevie Salas on his Colorcode album. No real solo, unfortunately, but the last 60 seconds to the fade has a great bass and drum section. This is therefore, a great album for introductions to some high quality acts from the Nola Blue and Blind Racoon roster…there isn’t a bad track here and it is good value, unless of course you already have a lot of them…a word of warning; if you don’t have them, you will want them by the time you’ve listened to this. I just read your review of the Blind Raccoon NOLA Blues Collection. You mentioned my song Evangeline and compared it favorably to Son House. Son House has been a direct and profound influence on my music since I was 14. Your kind review was a wonderful gift and truly made my week. Thanks so much.